In order to evaluate, interpret and judge the wine we are drinking, we examine it’s appearance, smell and taste. It is tempting to skip the first step and go nose-deep into the glass. But you could be missing some valuable information, how a wine looks can tell you a lot about its style. Your tasting environment should be as neutral as possible. Natural light is best when inspecting the appearance of your wine. If your table or countertop is dark, grab a piece of paper or white napkin to place under your glass. Pour the wine into an appropriate drinking vessel, preferably not a mason jar or plastic cup. The proper stem ware is important, as it is produced to maximize the potential of your wine. Once the wine is in your glass, tilt it to a 45 degree angle. What are we looking for when we look at our wine? The standard, industry set of checkpoints are: clarity, intensity and colour. There are other observations you might make, but these are the basic components of ‘appearance’. Is the wine clear or cloudy? There could be sediment in your glass that can be avoided with proper decanting. Or the lack of fining and filtering could leave the wine hazy. What can be interpreted from your wine’s clarity? Visible sediment may indicate that a wine is older. Sediment will accumulate as the wine ages, this tannic acid collects and creates a mass that is suspended in the wine. In a wine that has aged and is stored properly, the sediment will tend to collect around the neck of the bottle. This is why you should stand the wine up to allow the sediment to collect at the bottom of the bottle before decanting and serving. Minimal or no fining and filtering. Some producers opt to only perform basic sedimentation (allowing gravity to pull particles away from the wine) then rack the wine from the lees. You may ‘rack’ a wine multiple times to increase the clarity of the wine. After racking, wines may be fined. Fining is the process of adding a coagulate to the wine that bonds the small particles together. They are then large enough to form a sediment that can be racked. Faults. Sometimes an excess of sediment or cloudy-ness is indicative of a fault in the wine. If you are unsure whether your wine is faulty at this point, assessing the intensity, colour and aromas/taste will help confirm your suspicions. Possible culprits to a hazy wine? It was not in a temperature controlled environment. When a wine is exposed to prolonged heat, the proteins in the wine can appear hazy. There could also be some microbiological activity. This will be clear to you when you taste the wine – it won’t taste good, but will not be harmful either. If there is some effervescence to the wine and it has a soda-water quality, the wine may have undergone a secondary fermentation in the bottle. Again, this is not ideal, but is not harmful to you. Lastly, is your glass clean? We know stem ware is pesky to clean and polish, but be sure that your glass isn’t smudged or dirty, and that there is no debris that would be confused with cork or sediment in your wine. The intensity is the depth of colour, and is described as either pale, medium or deep. To determine the intensity, we look at how deep the colour is at the core and how consistent the colour is from core to rim. 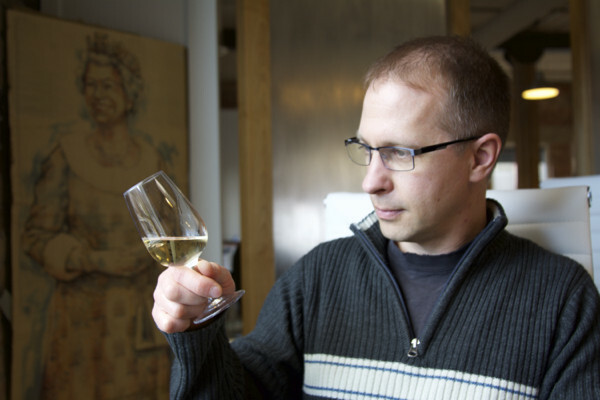 White wines are easier to determine intensity based on the transition of colour from core to rim. Because all white wines generally have a core that is paler than reds, you need to judge on a scale separate to red wine. The outermost rim will always be colourless. If the colourless rim extends towards the core, it is pale. 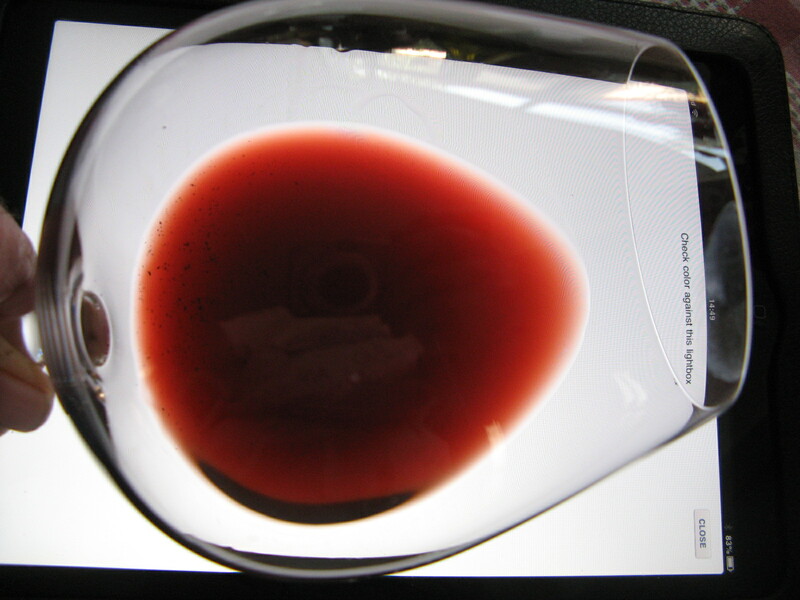 If the deepest colour from the core extends consistently, close to the rim, the wine is deep. 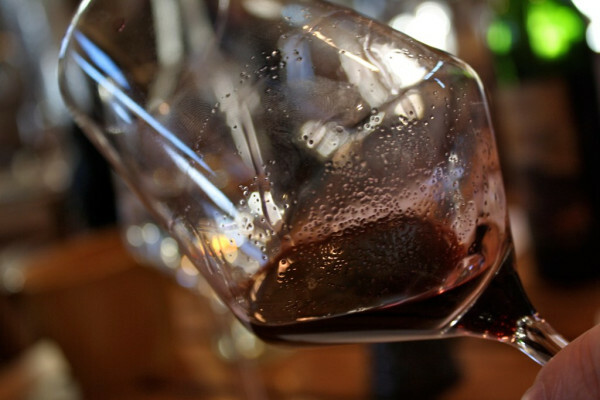 Red wines can be examined similar to white wine. If the colour from the core extends consistently to the rim, it is deep. And if the outside watery rim is very broad, it would be considered pale. Another trick to help determine the intensity, place a book or print underneath your glass. Can you read the words (pale), see the words, but not clearly (medium), or not see anything through the wine (deep)? There are some differences in technique when examining a red wine compared to white wine. When examining the colour of a white wine, tilt the glass and look at the core. This is the centre of the glass and will be the deepest and darkest colour. For red wines, tilt the glass and look at the wine between the core and the rim. The colour of the wine can help us determine many different things, or at least give us hints! The most important and easiest to identify factor of a wines’ colour is its age. A white wine that is youthful will typically be lemon, or lemon-green. An aged white wine will have turned to amber or brown. Red wines in their youth are are purple or ruby, and will transition to garnet or brown. Wines will show their age at different rates. For example, Cabernet Sauvignon will hold it’s youthful appearance longer than a Pinot Noir. It is difficult to determine the exact varietal of a wine based on it’s colour, but certain wines are easier to identify than others. Most white wines will fall within a spectrum of lemons. A light bodied whites with reflections of green, we we would infer is a Pinot Grigio, not a Chardonnay. Similar in red wines, a purple wine is more likely a Mourvedre and not a Grenache. You can also deduct whether a wine is grown in a cool climate or warm climate. The appearance of green in a white wine, is actually chlorophyll. This could tell us that the grapes might not be fully ripened, from a cooler climate or a cooler vintage. Red wines from a hotter climate will be more opaque and deeper. Cooler climate red wines have less pigment. Think of a Pinot Noir from Sonoma compared to a Pinot Noir from Washington. There are other implications that can affect the depth of colour, but these 2 very different climates will produce a Pinot with a different depth of colour. A winemakers methods and preferences also have an impact on the colour of a wine. A Chardonnay that is fermented in stainless steel will be brighter lemon, while a barrel fermented Charonnay will have more gold hues. Some wines are also deliberately oxidized, these are usually fortified or dessert wines. Their colours will appear ‘aged’, amber, brick, tawny and brown. These methods of production are all controlled by the winemaker, and not indicative of fault or wine that is too old. What else is in my glass? Bubbles in sparkling wine are a great thing, bubbles in a still wine are not. If you find that your Syrah is fizzy, the wine most likely went through a secondary fermentation in the bottle. This is not intentional. If you are drinking a Prosecco, Champagne or Cava, take note of the bubbles. Are they tiny and delicate or vigorous? Do they dissipate quickly, or last for a long time in your glass? You can assess the quality of a sparkling wine by its bubbles. After tasting the wine, you will be better equipped to determine if the bubbles are delicate, creamy or aggressive. Tears or legs? All wine will form tears on the side of the glass. Have you noticed when you swirl your glass to open the aromas, the wine tends to stick to the side and run down in a pattern around the glass? These demonstrate the viscosity of the wine, with higher sugar and alcohol content, the tears are thicker. Next time you enjoy a WineCollective wine, be sure to log in and give your comments! We want to know what you see in your glass.